seven − two = Required Please enter the correct value. One of the first steps to take in identifying the best tech stocks to buy is to look for industries on the verge of massive growth. Or, as Money Morning Defense & Tech Specialist Michael A. Robinson says, "ride the unstoppable trends – that's vital if you want to amass meaningful wealth." And one of the biggest unstoppable trends in tech right now is cloud computing. 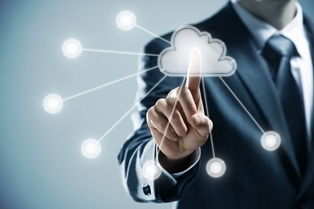 Cloud computing is the process of storing and accessing data over the Internet, rather than on a computer's hard drive. It allows companies and individuals to access data and share data faster and more effectively. According to Forrester Research, the cloud computing industry was valued at $41 billion in 2011 – and will grow 487% by 2020. "Cloud computing is one of the biggest global tech trends out there today," according to Robinson. "The cloud is benefitting from the fact that companies want to keep a lid on their computing costs by outsourcing data centers to third-party vendors." Cloud computing firms assume the costs of purchasing and maintaining data storage equipment. "We're talking about a $241 billion market at the end of this decade versus just $41 billion three years ago," Robinson said. "The cloud is the future of computing in the United States and globally." The first stock Robinson recommends actually gives investors a play on two companies. EMC Corp. (NYSE: EMC) is a global leader in the cloud computing field, and it also owns the spin-off company Pivotal Inc., which is becoming a major player in the Internet industry. "EMC makes some of the very best hardware for mass-data storage," Robinson said. "And it's actually gaining market share, a tough feat for a sector leader that's usually the target of all the other sector upstarts." According to the International Data Corporation, EMC owns more than 30% market share of the storage hardware segment, which is more than two and a half times the market share of its nearest competitor NetApp Inc. (Nasdaq: NTAP). The stock has an operating margin of 19% and a return on stockholders' equity of 13%. Additionally, quarterly earnings were up 17% in its last quarterly report. With the spin-off company Pivotal Inc., investors also get a play in the "Big Data" industry, an area Robinson relates to cloud computing in terms of profitability. Pivotal is not yet public, but is primed for an IPO. Until then, Robinson recommends playing the company by purchasing EMC stock. EMC stock is up 7% in 2014 and more than 23% in the past 12 months. What stocks do one invest in to get bitcoins or investment funds?